Originally posted: July 14, 2018 . Last modified: March 18, 2019 . 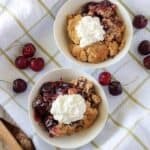 A simple, delicious, homemade cherry crisp that doesn’t use cherry pie filling. In less than an hour you can make a cherry dessert that everyone will love. Crisps are some of my favorite desserts. We already have an apple crisp recipe on the blog, so Kim wanted to add another one. What could be better than apple crisp, you ask? Well, we think our cherry crisp is just as good. Kim hopes you’ll feel the same way too. 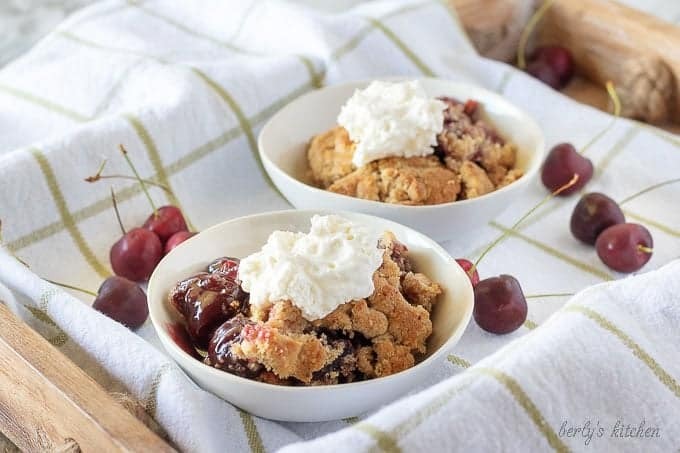 Before getting started, Kim looked at a few cherry crisp recipes and noticed a trend. Everyone seems to use cherry pie filling. I feel cherry pie filling is, well, gross. There was no way we were going to sully an awesome topping with a canned fruit concoction. So, Kim put in the extra time to make a homemade filling. I think you’ll be pleased with the results. First, go ahead and preheat your oven to 350 F. degrees and grease a 9 x 13 baking dish. Set the dish aside. Once that is done, prep your ingredients, like washing and pitting the fresh cherries or thawing the frozen ones. Next, in a large saucepan, combine the cherries, sugar, cornstarch, and cinnamon. Give everything a good stir to mix in the cornstarch. Then, cook the cherries over medium-low heat until the mixture thickens then remove from heat. It should take about 10 minutes and the cherries should have a nice thick consistency but still have some liquid. Last, pour the filling into the prepared baking dish and then get started on the topping. 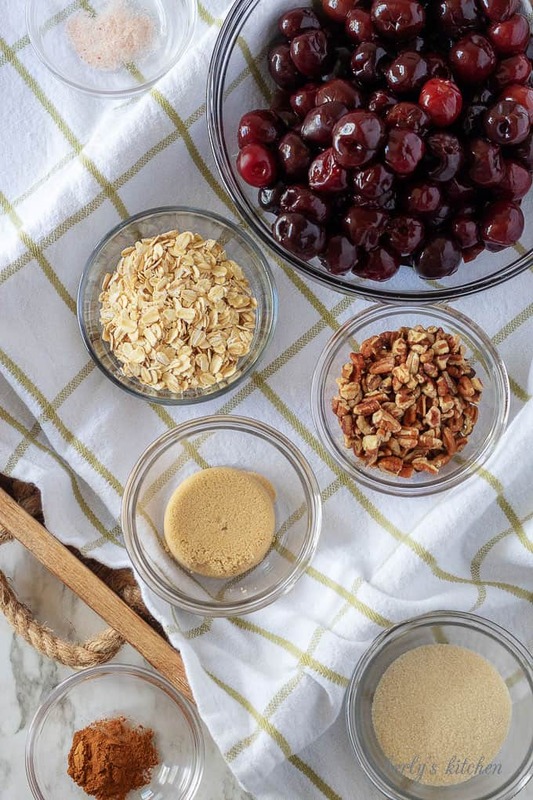 Using a medium bowl or food processor, combine the flour, oats, butter, sugars, salt, cinnamon, and pecans until a crumble forms. 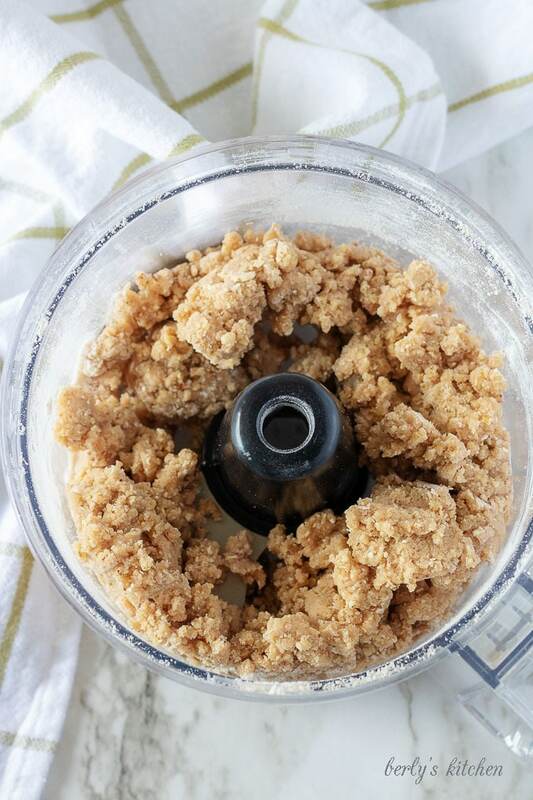 Now, if you’re not using a food processor you’ll need to chop up those pecans and do your best to mash that butter into the other ingredients with a pastry cutter or fork. Afterwards, use your fingers to place the topping over the cherry filling in an even layer. There may be some areas that aren’t covered or you might have extra cherry crisp topping like we did. First, place the crisp in the oven and bake it for 30-35 minutes or until the top is golden brown. You may have to turn it once halfway through the cooking process if your oven doesn’t cook evenly. Not everyone has a custom kitchen, some us live in rentals. Next, remove from the cherry crisp from the oven and allow to cool before serving. Then, top it with ice cream, whipped cream, or your other favorite toppings. Last, store any leftovers in a sealed container for up to three days. If you are using frozen cherries, please make sure they thawed out completely and have been patted dry with paper towels. The crisp topping can be made gluten-free by using a gluten-free all-purpose mix. In case you are wondering, yes, you can freeze this dessert once it’s been completed. 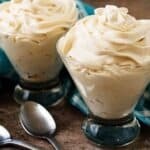 Top this dessert with one of our whipped creams, like our Homemade Whipped Cream or our Irish Cream Flavored Whipped Cream! 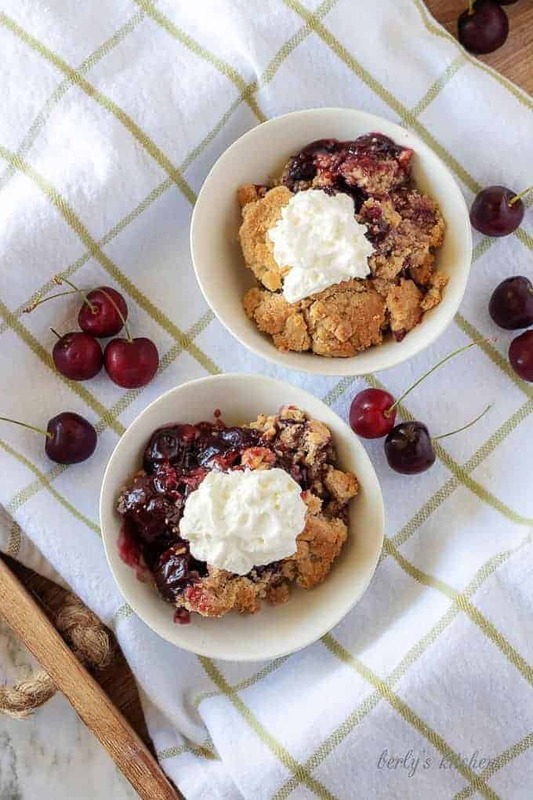 A simple, delicious, homemade cherry crisp that doesn't use cherry pie filling. In less than an hour you can make a cherry dessert that everyone will love. First, preheat oven to 350 degrees F. and grease a 9 x 13 baking dish. Set aside. Next, in a large saucepan, combine the cherries, sugar, cornstarch, and cinnamon. Then, cook over low heat until the mixture thickens then remove from heat. Last, pour the filling into the prepared baking dish. In a medium bowl or food processor, combine the flour, oats, butter, sugars, salt, cinnamon, and pecans until a crumble forms. Use your fingers to place the topping over the cherry filling in an even layer. There may be some areas that aren’t covered. First, place the crisp in the oven and bake for 30-35 minutes or until the top is golden brown. Next, remove from the oven and allow to cool before serving. Then, top with ice cream, whipped cream, or your other favorite toppings. Last, store covered for up to three days. The calories listed are an approximation based on the ingredients and does not include the whipped topping. Actual calories will vary. The cherry crisp can be stored in a sealed container on your counter for up to 3-days. My whole household loves cherries! It is about the only thing we agree on! This is something I will be making soon and everyone will be in love I am sure. Thank you for the new recipe for a crisp! Apple or blueberry has always been our go to. Oh me, oh my, I love a good crisp anything. 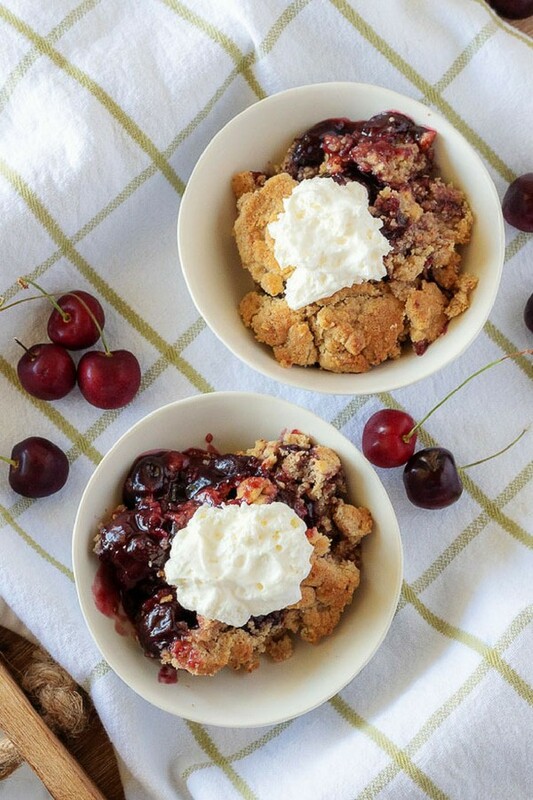 This is the perfect recipe for this time of year as cherries are in season. 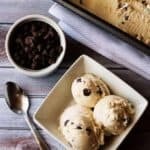 I’m such a fan of these types of dessert recipes, as I’m gluten-free it’s easy to make alternations. I love literally anything with a crisp topping! I would love to make this for the holidays.